Hello. For those of you who are returning to my blog, welcome back and thank you for returning….and to those of you who are visiting for the first time, welcome and thank you for visiting. I just arrived back in Boston a few hours ago from the United States Conference of Catholic Bishops fall meetings in Baltimore. There has been much public discussion about the meeting�s topics and agenda. I�d like to share with you some of the events of the week, as well as some related reflections. 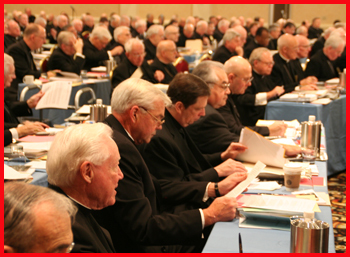 This past week at the U.S. Conference of Catholic Bishops meetings, the Bishops looked at different documents that various committees have composed; one on the ministry to people with homosexual inclination, another one on the preparedness for the reception of Holy Communion, another one on marriage�none of the documents pose new teachings of the Church�.basically, simply trying to help our people have a deeper understanding of what is in the Catechism and what the teachings of the Catholic Church have always been. 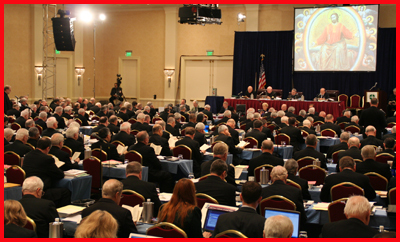 We also worked on restructuring the Conference, trying to amalgamate committees, and planning for the future�trying to be more flexible so that we can address the various pastoral needs of Catholics in the United States. During these November meetings, there are always elections for presidents of committees and I was elected to be president of the Committee on World Mission. As president, one chairs the committee meetings and also has a seat on the Administrative Board, which is the board that gathers to write the agenda for the annual November meeting and does the business of the Conference between sessions. 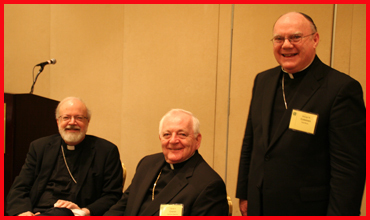 Our Bishops from the Archdiocese of Boston were also in attendance for the meetings in Baltimore � Bishop Irwin, Bishop Boles, Bishop Allu�, and Bishop Edyvean joined us at the Conference meetings. 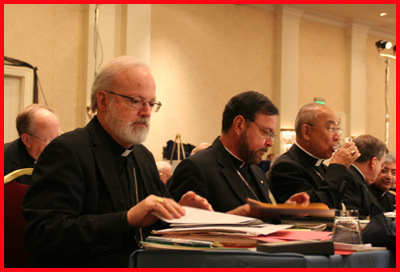 Additionally, our two new Bishop-elects were at the Conference, Bishop-Elect Hennessey and Bishop-elect Dooher. They were presented to the whole body of Bishops at the first session on Monday morning. 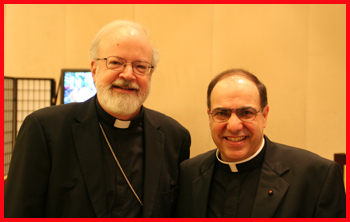 It was a chance for the presence of our new Bishops to be recognized. 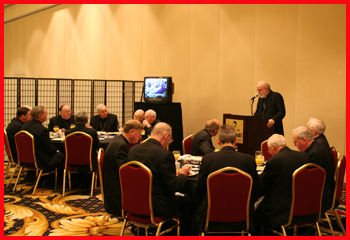 Every year we sponsor a breakfast for Blessed Pope John XXIII Seminary. We invite the Bishops to come learn more about the seminary. Fr. Peter Uglietto, Rector of Blessed John XXIII, joined us in Baltimore to speak with Bishops about the wonderful formation program we offer in the Archdiocese of Boston to train second career men who feel called to the priesthood. We have men from about 30 dioceses studying at Blessed Pope John. There were also a number of alumni of Blessed Pope John XXIII who came to the breakfast, including Bishop Paul Swain of Sioux Falls. 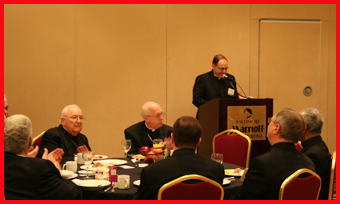 Archbishop Alfred Hughes of New Orleans, Louisiana, also came to the breakfast. 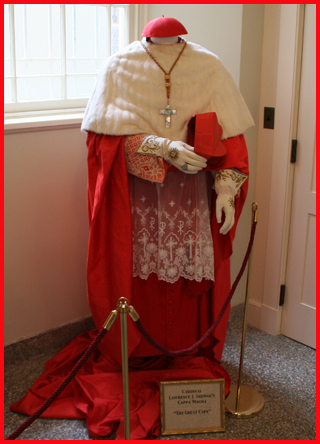 Archbishop Hughes was born, raised and ordained in the Archdiocese of Boston. He attended St. John Seminary and later returned to St. John for 24 years as a professor, Spiritual Director and Rector. We also had a Diocese of Fall River reunion of sorts, as current Fall River Bishop George Coleman and Archbishop Daniel Cronin, Fall River�s 5th Bishop, joined us for the breakfast. As you may know, I succeeded Archbishop Cronin in Fall River during 1992. 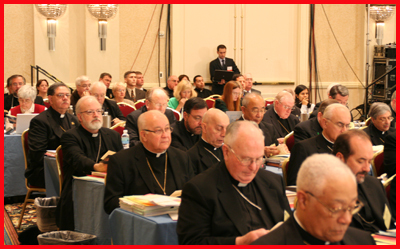 This year’s annual U.S. Bishop Conference fall meetings in session. View from the middle of the very large ball room where we they held the sessions. 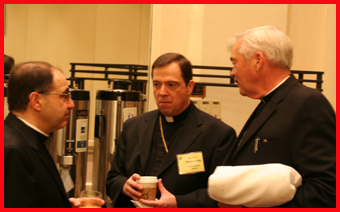 Bishop-elect Robert Hennessey and Bishop-elect John Dooher during the meetings. We host an anual breakfast for Blessed Pope John XXIII Seminary each year at the annual Fall gathering and invite the Bishops to come learn more about the seminary. Blessed Pope John XXIII Seminary’s Rector Fr. Peter Uglietto addressing the Bishops. Fr. Uglietto, Bishop Boles and Bishop Paul Swain of Sioux Falls. Fr. 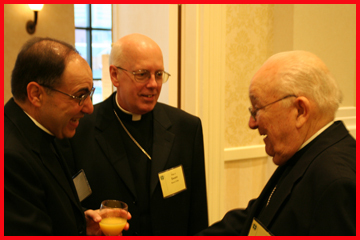 Uglietto speaking with Bishop-elects Dooher and Hennessey after the Blessed Pope John XXIII breakfast. 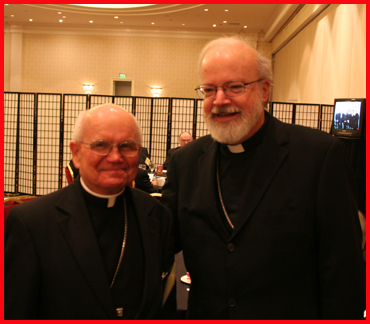 Current Fall River Bishop George Coleman (standing) and Archbishop Daniel Cronin, Fall River�s 5th Bishop. Blessed Pope John XXIII Rector Fr. Peter Uglietto. 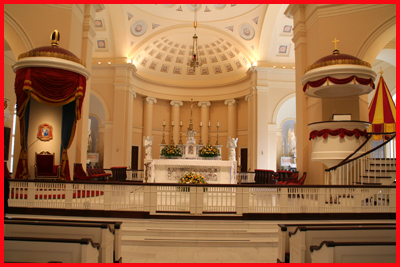 When we first arrived in Baltimore for the Bishops Conference, we were invited to take part in the dedication Mass on Sunday for the renovated Basilica of St. Mary of the Assumption, the Baltimore Basilica. It was a wonderful occasion to showcase this very historic church, where so much of the history of the Church in the United States took place. In Maryland (“Mary Land”), which was the Catholic State�the King of England gave to Lord Baltimore�was the one of the few places in the New World where there was religious freedom because the Catholics allowed other people to come practice their faith there as well. Among the very outstanding families of that time, were the Carrolls of Carrollton. One of them, Charles Carroll, was a signer of the Declaration of Independence. Another Carroll, John, was the first Bishop in the United States. 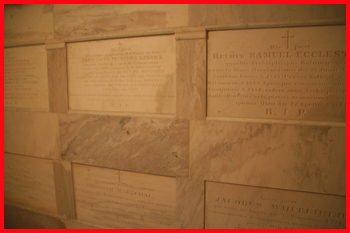 He was a Jesuit and founder of the first University, Georgetown. He was the one who actually began the impetus of building this cathedral. 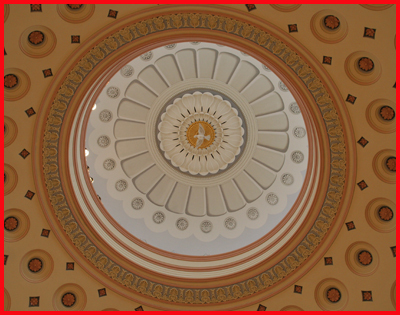 It�s out of the Baltimore Basilica that three Plenary Councils took place, with the First Plenary Council taking place in 1852. 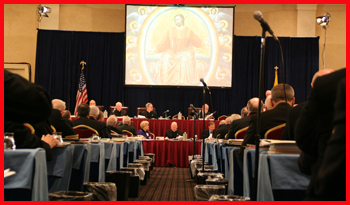 It was at the Third Plenary Council that the Baltimore Catechism was written. I believe that was the largest meeting of Catholic Bishops ever held outside of Rome since the Council of Trent. For the first period in our history this was the only cathedral and the only diocese in the United States. 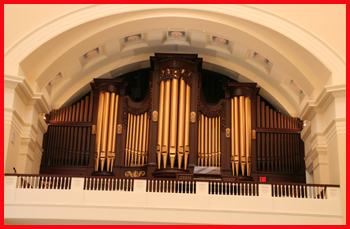 In 1808, four dioceses were formed � Philadelphia, New York, Boston and Bardstown. 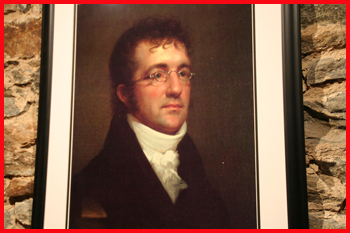 That�s why in two years we will be celebrating our 200th Anniversary in Boston. Our first Bishop, Bishop Cheverus, came to Baltimore to be ordained a Bishop. He was ordained by Bishop Carroll. In those days, Bishop Cheverus was probably the only diocesan priest that was a Bishop in the United States. 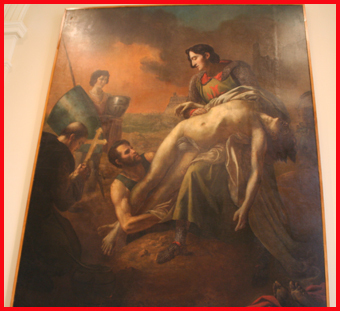 The first Bishop of New York was a Dominican and he died on the way to New York. Cardinal O’Connell used to say that he was his successful successor � he didn�t make any mistakes at all�..lol. 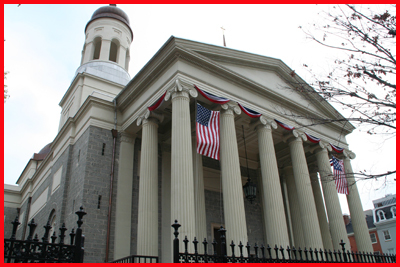 Bishop Carroll was elevated to Archbishop in 1808, during the early years of the construction of the Baltimore Basilica. As I mentioned, he was the United States� first Archbishop and he was responsible for Catholics in an area of roughly two-thirds of our country. He was certainly a visionary and founding leader of the United States Catholic Church. 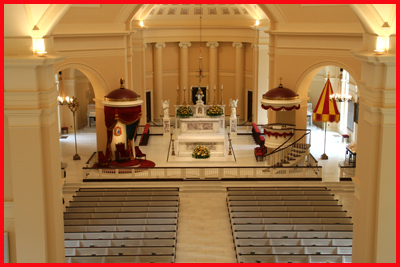 The Baltimore Basilica is official named the Basilica of the National Shrine of the Assumption of the Blessed Virgin Mary. Front exterior of America’s first Cathedral, the Baltimore Basilica. 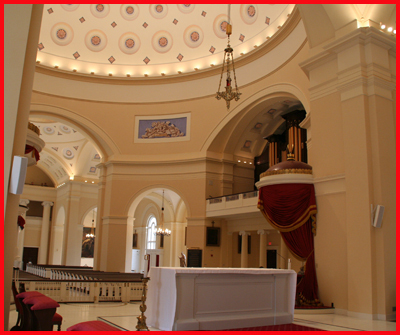 Inside the newly restored Baltimore Basilica. 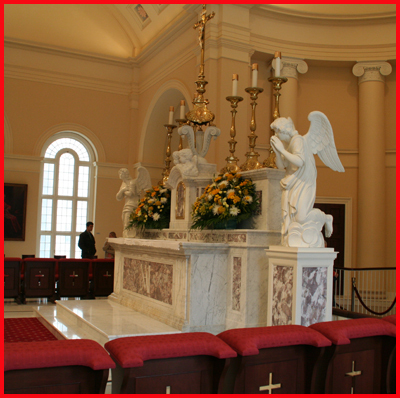 View of the altar area. 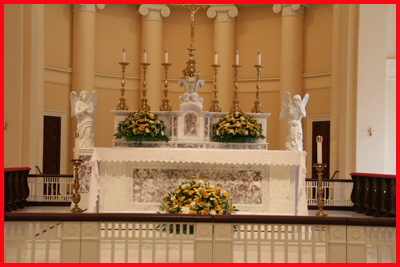 Another view of the altar area. View from the altar looking out at the pews. 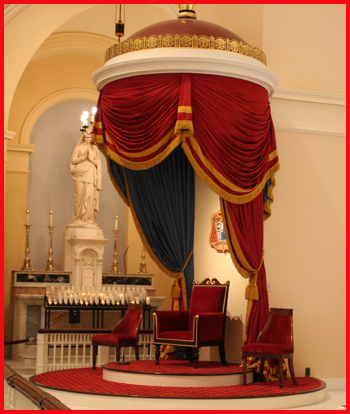 The Cathedra – the oldest Bishop’s chair in the United States. 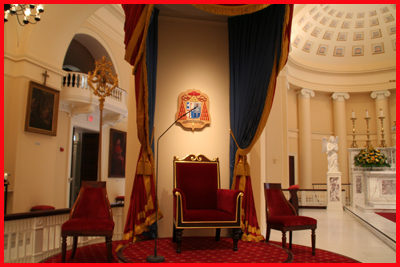 Another view of the Cathedra. 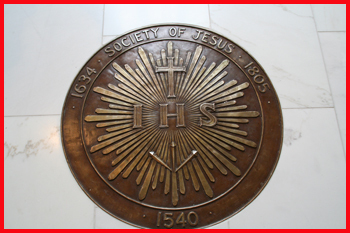 Archbishop John Carroll was a Jesuit. He was educated by the English Jesuits in Flanders with other family members. 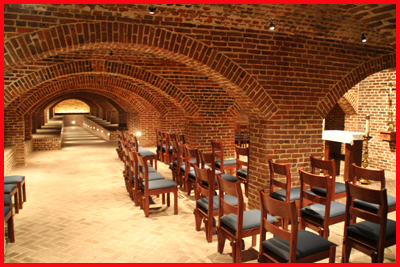 The Jesuits have been great supporters of the Baltimore Basilica over time and its recent renovation. 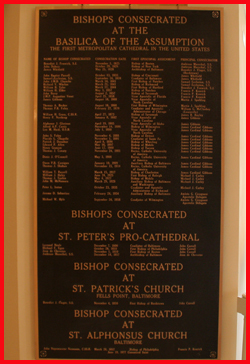 A plaque listing Bishops consecrated at the Baltimore Basilica. Boston’s first Bishop, Bishop Cheverus, is listed on the plaque. 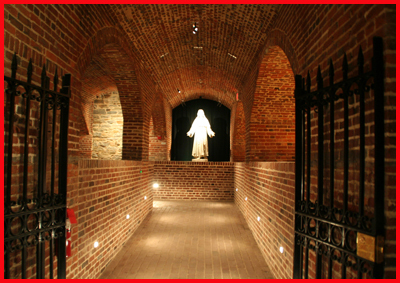 In the basement of the Basilica, there is a small museum of sorts with many artifacts of the history of the Baltimore Basilica and the U.S. Church. 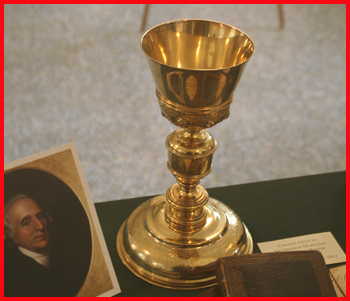 This is a chalice given to Archbishop Marechal by Bishop Cheverus in 1817. 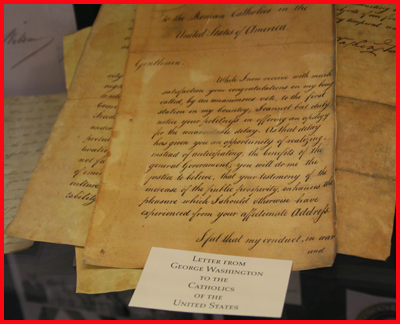 A letter from George Washington to Catholics of the United States. 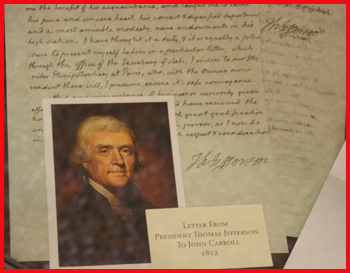 An 1812 letter from Thomas Jefferson to Archbishop Carroll. Another view of the chapel beneath the Basilica. Hanging near the “Our Lady Seat of Wisdom Chapel” is a portrait of Benjamin Latrobe. Latrobe is credited as one of the leading founders in modern architecture in the U.S. 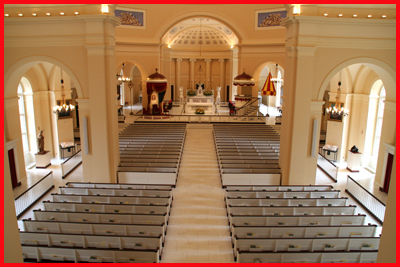 He donated his services to design the Baltimore Basilica. 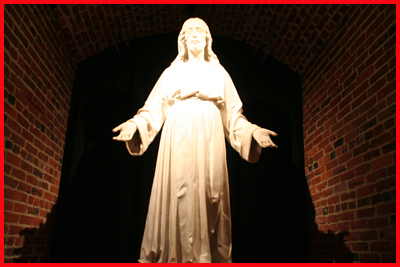 “Life-size” statue of Jesus located a short distance from the downstairs chapel. Another view of the same statue. 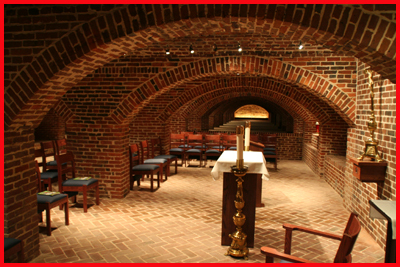 There is an “Archbishop’s Crypt” located next to “Our Lady Seat of Wisdom Chapel” under the Basilica, the final resting place of eight of Baltimore’s 12 deceased Archbishops, including Archbishop Carroll. 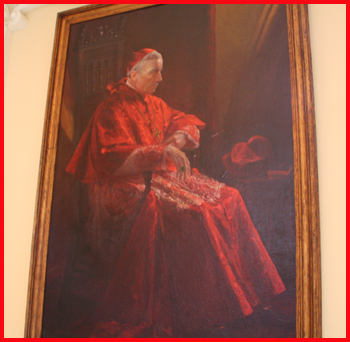 Portrait of Cardinal James Gibbons, named Bishop of Baltimore in 1877, hangs in the Basilica. 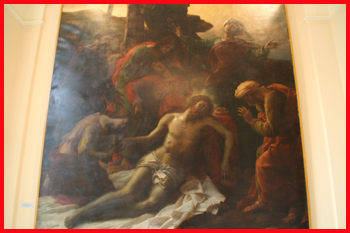 Also hanging in the rear of the Basilica is a painting called “The Descent From The Cross.” The painting was commissioned by Louis XVIII. 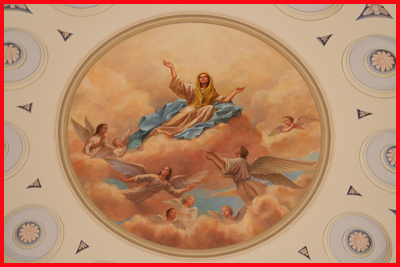 Beautiful art work on the ceiling of the Basilica. The artwork in the Basilica was very bright. 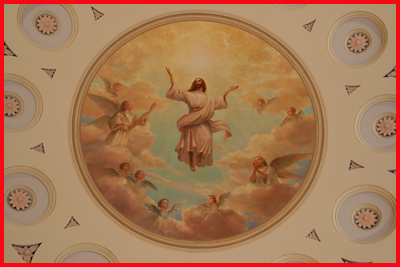 The artwork on the ceiling inside the middle dome of the Basilica. 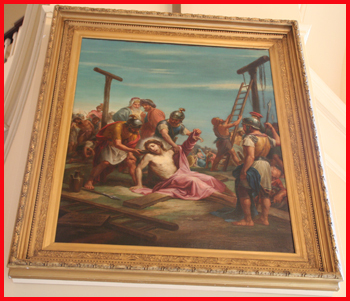 The original Basilica paintings depicting each of the Stations of the Cross were restored. 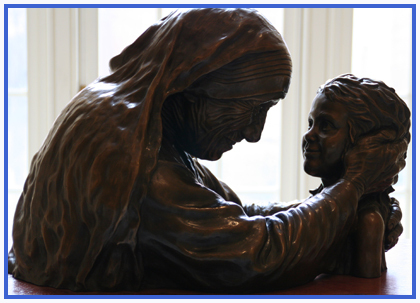 Inside the Basilica, there is a bust called “The Blessing,” depicting Mother Teresa of Calcutta. On May 29, 1996 Mother Teresa Witnessed the profession of 35 of her Missionaries of Charity in the Baltimore Basilica. With Thanksgiving Day next Thursday, I thought that I would make my post for next week on Wednesday, November 22. In that post, I will have a message to all of our men and women from the Archdiocese of Boston serving in the military, their families and to our military chaplains. Well, I hope you have a peaceful and enjoyable weekend. Until my post next Wednesday��.